Preston North End was established as a football club in 1878. Major William Sudell, the manager of a local factory, became the secretary of the club. Sudell decided to improve the quality of the team by importing top players from other areas. This included several players from Scotland. Over the next few years players such as John Goodall, Jimmy Ross, Nick Ross, David Russell, John Gordon, John Graham, Robert Mills-Roberts, James Trainer, Samuel Thompson and George Drummond joined the club. As well as paying them money for playing for the team, Sudell also found them highly paid work in Preston. In an attempt to stop this migration of players, the Scottish Football Association made it clear that it would not select players for the Scotland international side who played in England. This action failed to stop footballers moving south. Blackburn Rovers followed the example of Preston North End. would have to persuade some better players to join the club. In 1880 the club signed Hugh McIntyre from Glasgow Rangers. McIntyre was attracted to the town by his appointment to run the Castle Inn. Another footballer who had learnt his trade in Scotland, Fergie Suter, who had been playing for rivals Darwen, also joined Blackburn. This enraged Darwen who accused Blackburn of paying Suter for his services. At this time football professionalism was illegal. However, Darwen did not make an official complaint as it was well known that Suter had given up his career as a stonemason as soon as he arrived in Lancashire. McIntyre and Suter had both played their early football in Scotland. So also did their third signing, Jimmy Douglas who had played for Paisley and Renfrew. In 1882, Blackburn Rovers became the first provincial team to reach the final of the FA Cup. Their opponents were Old Etonians who had reached the final on five previous occasions. The public school team won 1-0. In 1883 Blackburn added another Scotsman into the team. John Inglis, a Scottish international, had recently been playing for Glasgow Rangers. That year Blackburn beat Padium (3-0), Staveley (5-0), Upton Park (3-0), and Notts County (1-0) to reach the final of the FA Cup. After Blackburn Rovers beat Notts County the club made an official complaint to the Football Association that John Inglis was a professional player. The FA carried out an investigation into the case discovered that Inglis was working as a mechanic in Glasgow and was not earning a living playing football for Blackburn Rovers. John Inglis played in the final against Queens Park at outside left. Other Scots in the team included Jimmy Douglas (outside right) Fergie Suter (left-back) and Hugh McIntyre (centre-half). The Scottish club scored the first goal but Blackburn Rovers won the game with goals from James Forrest and Joe Sowerbutts. Blackburn also went on to win the FA Cup in 1885 and 1886. 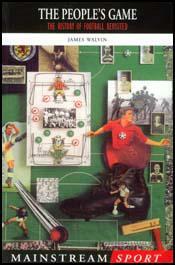 The first season of the Football League began in September, 1888. Preston North End won the first championship that year without losing a single match and acquired the name the "Invincibles". Eighteen wins and four draws gave them a 11 point lead at the top of the table. Preston North End also beat Wolverhampton Wanderers 3-0 to win the 1889 FA Cup Final. Preston won the competition without conceding a single goal. The heart of the team was made up of players recruited from Scotland, Jimmy Ross, Nick Ross, David Russell, John Gordon, and George Drummond. Preston also won the Football League the following season. Blackburn Rovers and Preston North End had both shown that success could be achieved by buying players from Scotland. Other football clubs in England also developed a policy of sending their scouts to Scotland and over the next few years there was an exodus of the country's best footballers.